Sebastian and Vero Beach will experience a partial solar eclipse in the afternoon. 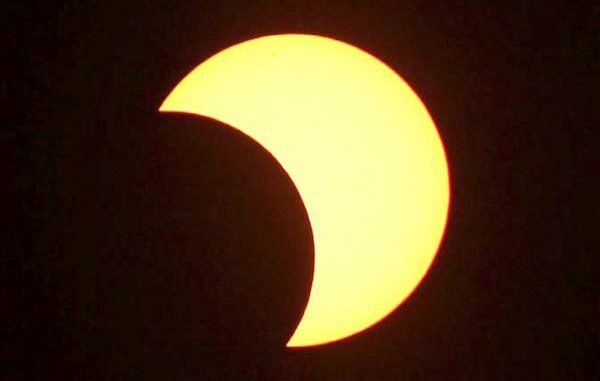 SEBASTIAN – According to officials with the Indian River County Emergency Services, the actual time of the Partial Solar Eclipse in Sebastian and Vero Beach will begin at 1:23 p.m. and will conclude at 4:17 p.m. The duration of today’s event in Sebastian and Vero Beach will be 2 hours and 55 minutes. Be sure to protect your eyes. Never look directly at the Sun without proper eye protection. You can seriously hurt your eyes and even go blind. A total solar eclipse happens when the Moon completely covers the Sun. Today’s partial solar eclipse will be visible along a 70-mile wide path from Oregon to South Carolina. Locally here in Sebastian and Vero Beach, we will see a partial solar eclipse. A partial solar eclipse happens when the Moon comes between the Sun and Earth, but the Moon only partially covers the Sun. The next total solar eclipse will be in 2024.